Mismanaged mercury can be toxic and under certain circumstances can have detrimental effects on the nervous system as well as the environment. Removing mercury thermometers and thermostats from the trash or the sanitary sewers is of considerable benefit to the environment. How can you tell if your thermometer or thermostat contains mercury? Mercury thermometers have SILVER, METALLIC GREY or BLACK filling in their bulbs. Any other color filling indicates it is a non-mercury thermometer and it may be thrown in the trash at the end of its life. Mercury thermostats have have dials or levers that you need to manually adjust. If you take their faceplate off and see one or more glass ampoules (a sealed glass capsule) containing a silver substance, you have a mercury thermostat. If you have mercury thermometers or thermostats you can bring them to OCRRA’s Ley Creek Drop-Off Site, year-round and receive a $5 Lowe's gift card as a reward*. The thermometer exchange program is made possible through a partnership between OCRRA and Covanta, the operator of the local Waste-to-Energy Facility. A portion of the program cost is also underwritten by a grant from the New York State Department of Environmental Conservation. 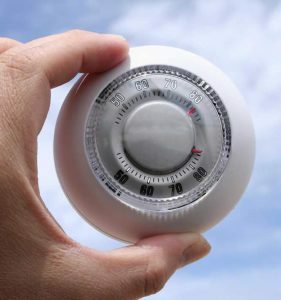 Click here for a list of other locations that accept THERMOSTATS in the community. * One gift card per resident drop-off, regardless of number of items turned in.